During the Holy Month of Ramadan, Muslims worldwide observe daily fasting during sunrise and sunset. For 30 days at sunset, those fasting will sit to observe 'iftar', a religious observance carried out throughout Ramadan. Shortly after, they will prepare for the day of fasting ahead with 'suhoor', before sunrise comes. What is iftar during Ramadan? 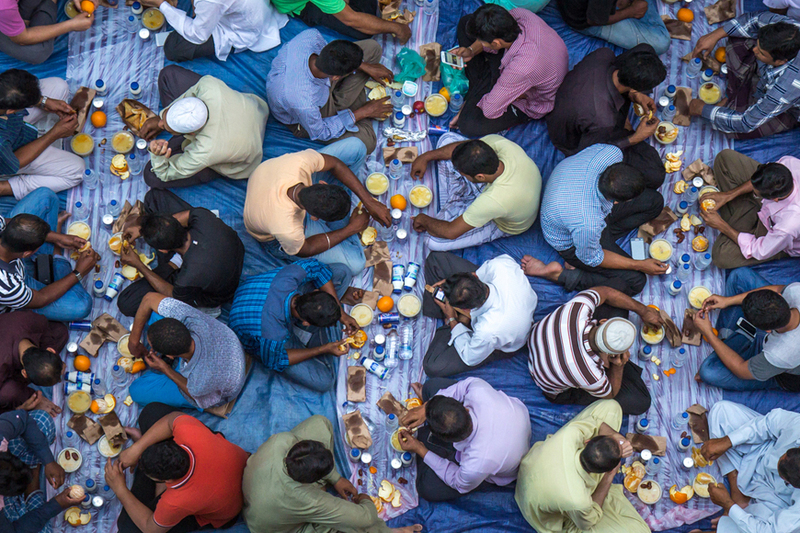 Iftar is often observed as a community, with people gathering with friends, family and their communities to break their fast together. For fasting Muslims, iftar is the meal to break their fast at sunset, at the time of the Maghrib prayer. Traditionally, people will enjoy dates, dried apricots and Ramadan juices, which are often followed by large meals, usually with family and friends. Iftar is very much a social event, with family and community members involved in the breaking of their fast for the day. It is common for families to host dinners for others, or gather as a community in their neighbourhood. Fun fact: 'Iftar' literally translates to 'breakfast'. It is pronounced, 'if-tar'. There are hundreds of lovely iftar buffets in Dubai and the UAE you can enjoy and join in with as a non-Muslim throughout Ramadan. You can even find great deals on Dubai iftars so you can break your fast, without having to break the bank! When is iftar during Ramadan? Iftar occurs just after sunset, before the Maghrib prayer. The prayer timings in Dubai differ from those in other areas of the UAE, such as Ras Al Khaimah, Abu Dhabi and Fujairah. We have a full list of prayer timings and iftar times in Dubai here for you. Just add four minutes for the iftar time in Abu Dhabi, deduct four for Ras Al Khaimah and add six for Fujairah. What Ramadan foods are served during iftar? Many hotels, restaurants and cafes host iftar buffets for both Muslims and non-Muslims to partake in; often these will include traditional activities too as well as buffet options, Arabic coffees, juices and more. Of course, as a fasting Muslim, it's imperative that the right foods are eaten to preserve an individual's health, and so foods served at iftars across Dubai reflect these required food types. To begin with, it is customary for Muslims to break their fast with dates and water. This helps to restore their sugar and salt levels to their body, as well as rehydrates them. What is suhoor during Ramadan? Suhoor is the meal taken before sunrise, before the day of fasting begins. This pre-dawn meal should encompass a wholesome meal, which provides long-lasting energy throughout the day. The word 'suhoor' means 'of the dawn'. Regarded by Islamic traditions, suhoor is believed to be a benefit of the blessings in that it allows a person fasting to avoid the crankiness or weakness caused by the fast. Many restaurants and hotels hold suhoor buffets in the earlier hours of the morning, following on from their iftar buffets the evening before. When is suhoor during Ramadan? The suhoor meal is eaten before sunrise, before the first prayer of the day known as Fajr. The prayer timings in Dubai differ from those in other areas of the UAE, such as Ras Al Khaimah, Abu Dhabi and Fujairah. We have a full list of prayer timings and suhoor times in Dubai here for you. What Ramadan foods are eaten during suhoor? As it's the meal before the day of fasting, it's important that it is filled with foods that provide long-lasting energy, such as complex carbohydrates and high-fibre foods. Complex carbohydrates are foods that are rich in energy, but release this energy slowly - for example, wholewheat, oats, beans and rice. Foods that are rich in fibre but digest slowly also include raw and unpeeled fruits and vegetables. Water and fluids with vitamins, like fresh fruit juices, should replace caffeinated drinks. What are the Maghrib and Fajr prayers? The Maghrib prayer is of significance as it is the 4th of 5 prescribed prayers for Muslims on a daily basis; the others are 'Fajr', 'Dhuhr', 'Asr' and 'Isha'a'. Fajr is the first prescribed prayer of the day. All Muslims must pray five times a day, every day, at the same time and facing the same direction. In Islam, this is known as 'Salat', which is the second of the Five Pillars of Islam. This requires that all Muslims who have reached puberty worship five times daily, facing the holy city of Mecca.